There are plenty of good foundations at the drugstores these days, but finding one that's a good fit for dry skin can be serious challenge. 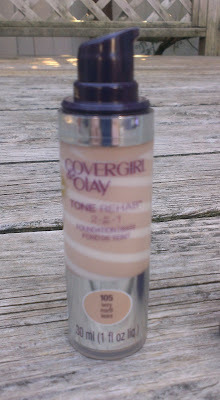 Recently, though, I'd read quite a few blog posts and watched quite a few YouTube videos about the Covergirl & Olay Tone Rehab 2-in-1 Foundation and the general consensus was that it played very nicely with drier skin. That makes sense since the marketing gimmick behind the foundation is that it contains a foundation and hydrating serum in one bottle. As you can see from the photo above, there's kind of a swirled thing going on with the foundation -- skin colored sections alternated with white sections. The packaging claims that the foundation instantly evens out your skin tone, reduces the look of discolorations, fine lines and wrinkles, while the serum moisturizes the skin. Now, plenty of that is pure marketing hype (no foundation that I've ever seen can reduce the look of fine lines and wrinkles. Some actually emphasize them, though, which is obviously a problem.) 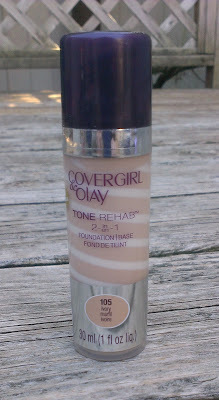 but this is definitely a nice, moisturizing foundation that is a good option for dry and mature skin. While it's a liquid formula, it has a thicker consistency than many liquid foundations but it melts into the skin nicely and definitely does some hydrating -- it doesn't cling to any of my drier patches or settle into pores or lines. And the bottle features a pump -- which I always appreciate in a foundation --so it's easy to get just the right amount of product out at a time. In terms of coverage, I'd say it's about medium. It definitely does an excellent job evening out the skin tone, but if you've got some serious discolorations to hide (like the big zit that's currently taken up residence on my chin; it's that time of the month, unfortunately. ), you'll need concealer to get the job done. The finish of the foundation is quite nice -- not really dewey, but not matte either. Natural or semi-matte, I'd guess you say. Basically, you just look like you've got nice skin with this foundation, not like you're wearing a face of full of makeup. 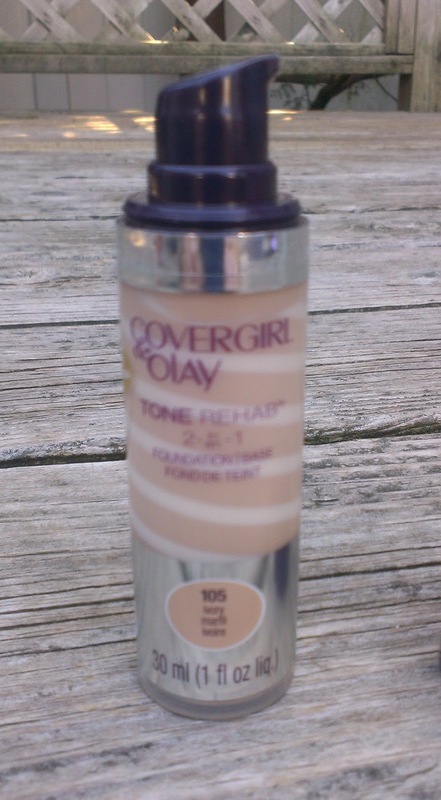 I apply the Covergirl & Olay Tone Rehab Foundation with my Beauty Blender (you know I'm obsessed), but I think it would blend in as well with a brush or fingers if that's your preferred method. I'm really, really happy with the formula. It's great for dry skin. That said, it's not without its issues. 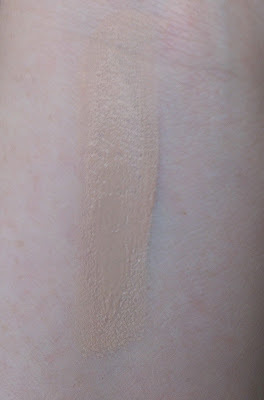 I purchased the foundation in the lightest shade -- Ivory 105 -- and once again, it's a bit too dark for my skin. It's a real shame, too, because this one of those rare foundation shades that's truly neutral -- not too much pink and not too much yellow -- so I think that it would work for almost anyone with fair skin... provide it was a tad lighter. The foundation also has a pretty strong floral scent that I'm not particularly fond of. I only smell it during the initial application, but it's worth pointing out for those who are extremely sensitive to fragrances. And I also have to mention the price of the Covergirl & Olay Tone Rehab Foundation. I've mentioned before that I feel like drugstore foundations have gotten pretty pricey these days, but this one takes the cake. At my local CVS, it retails for almost $17. In fact, the first time I went to the store to pick it up and saw the price, I decided not to buy it. Of course, I reconsidered a couple of weeks later when Covergirl was on BOGO-half off and I had some CVS Extra Bucks to bring the price down. I'm pretty sure that you could get the foundation for less at Walmart or Target, but it's still going to cost more than the usual $10 or $12 drugstore foundation. But then, if you have dry skin like me, you know how hard it is to find a foundation that cooperates with your skin so paying a little extra might be an okay tradeoff to have the convenience of being able to pick it up at the drugstore. And it really is a nice foundation. 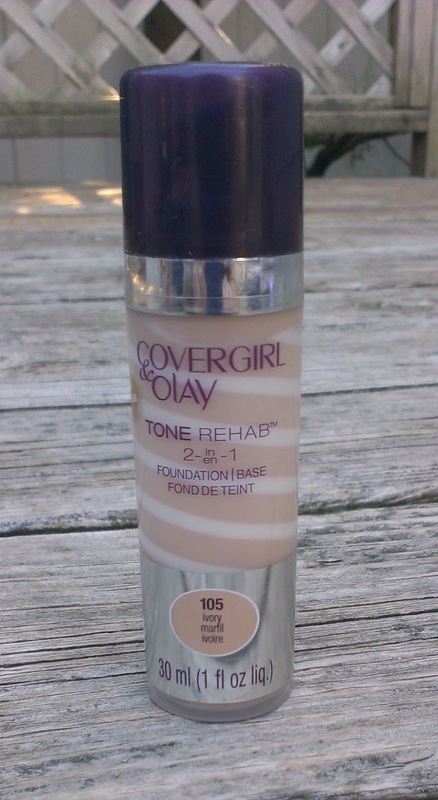 Have you tried the Covergirl & Olay Tone Rehab Foundation? What's your favorite foundation for dry skin?